We're experimenting with effects on the cars from missiles and mines right now, but they only get affected for a small amount of time right when they are hit by an explosion (flames spit from car for 2 seconds). Damage effects that visually affect the car throughout the race would be pretty cool, as well. We're not sure about affecting performance though, that could take away some of the fun of racing. If we were to have cars lose tires or explode, they would respawn shortly after, good as new. I like that the cars are basically supersonic, indestructable tanks. I'm defiantly all for the classic indestructible man-made metal monsters game play regarding the Cars, this really made the old games. But if you can have tarnish, burn marks, bullet homes and flames go for it! Have the flames and bellowing smoke coming out engine out-take for a few seconds. One request related to visual effects on the cars, will we be seeing signs of air friction panel heat? Glowing noses and scorching heat trails. I'd like to go one further. I'm all for visual damage as in dents and bits falling off (maybe) but perhaps the cars should over time 'repair' themselves using their ridiculous futuristic indestructible technology? (as in, over a period of maybe ... 10-15 seconds? The dents and stuff slowly get fixed and the car becomes good as new again). If you guys plan on including boosting inspired from Rollcage then there shouldn't be any internal car damage IMHO. I also agree with Broscar. Destructible environment should definitely impact the car (something that was removed from Rollcage 2, which you shouldn't get any inspiration from at all), but not blow it up into little pieces. potterman28wxcv: like wtf is ATD ? I think visual damage is a good idea. My mind just thinks of Burnout where if you drive well, your car tends to still be shiny by the end of the race, or if you get in some scuffles, you get some dents and bumpers falling off (minus the critical damage system). I was trying to think of some sort of temporary performance penalty for obtaining a large amount of damage, but I think that could lead to a big balance issue. Anything "performance" changing should be from the pick-ups and weaponry. I'm all for a visual damage system. Maybe even add an option to enable or disable it for some people who like seeing a perfect vehicle the whole race. KazzyMac wrote: I'd like to go one further. That's pretty damn genius. Supported. About gameplay : I have played Blur, and i remember that it was frustrating for me to fire a missile on a car, and not getting it blown up. Also, it's pretty much frustrating in Blur to have little health and be blown up by a small rock afterwards..
What I love in Rollcage is how being striken is not necessarily bad, and in some cases it can even propulse you to the finish line. That's an important part of what makes Rollcage fun. 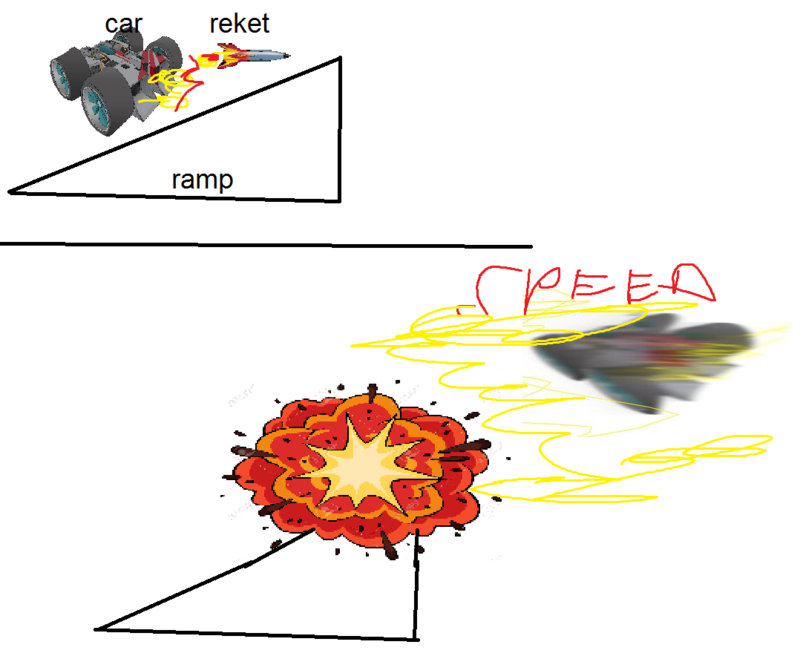 I'm not saying Grip should be Rollcage, but I think weapons should have very noticeable physical effects, which is why I'm against some kind of permanent car-shield before being blown up. potterman28wxcv wrote: About gameplay : I have played Blur, and i remember that it was frustrating for me to fire a missile on a car, and not getting it blown up. Also, it's pretty much frustrating in Blur to have little health and be blown up by a small rock afterwards.. I've never been blown up by little rocks on Blur ... and I've rarely fired a missile at a car and not had it blow up. But I was only referencing Blur in the other thread as an example of 'weapons done right'. KazzyMac wrote: I've never been blown up by little rocks on Blur ... and I've rarely fired a missile at a car and not had it blow up. Well I was just playing with friends, and I did not play it much.. I just remember that you have a weapon consisting of 3 small missiles, but these 3 missiles did something only if you manage to hit with all three of them. Still, when you're f*cked up with Blur, it's just your car spinning around and staying in place ; that's just about losing acceleration in fact + penalty time. While in Rollcage, it's much more than that, it's literally pushing your car away. You can end up in a very awkward situation, like if you are pushed in Road Works into the ground hole.. I prefer this rather than the "flip your car and wait before racing again"
Sounds like visual damage with no performance damage whatsoever is what you guys like most. I agree, it would cause too many balancing issues and too much frustration to have damage affect performance. Would be cool to have certain smaller parts fall off, but nothing major. I think damage effects should stay throughout a race though, then you can really get a feeling for which players had a rough ride and who didn't. But that's up for debate. If we were to implement some kind of Arena mode though? I'd say full damage with tires flying off and cars getting blown to bits. That boosting picture is hilarious. I'm all for stuff like that if it works ok with the physics engine. We probably won't actively try to implement something like that but we wouldn't take it out, either. That's the cool thing about Rollcage is that sometimes getting hit with a missile is a good thing if you're coming up to the finish line, or if you're in the lead and someone's targeting you with the 1st place missile, you can hit the brakes to let someone pass you and get hit. Chris_CE wrote: That's the cool thing about Rollcage is that sometimes getting hit with a missile is a good thing if you're coming up to the finish line, or if you're in the lead and someone's targeting you with the 1st place missile, you can hit the brakes to let someone pass you and get hit. You should've seen the games that we were having earlier then. Four of us REVERSING ON THE TRACK to try and hot-potato an incoming leader missile. Biggest bag of 'nope' imaginable. Funny as hell. x3. I go with the orders regarding visual damage, unless you want to add a Deathmatch modus that actually has you deplete the car's stamina to the zero value. i think making the cars blow up slows down the race wich i dont really want in a high-speed racer. adding scratches and burnmarks adds tons of immersion in a game where weapons and destruction is a core mechanic. drinving through the flaming ruins of a recently razed building, setting party of your vehicles on fire for a few seconds that leave burn marks afterwards just adds to that already brutal feeling of weapon based racers while car invincibility keeps the flow. i get more annoyed when my car blows up and i have to respawn than when im thrown up because of a rocket, even if both actions take the same time. I voted for cars being invincible tanks, minus some cosmetic damage. In this game you are thrown around a lot and sometimes so hard that taking those impacts into account for damage assessment should probably vaporize you compared to a standard rocket-in-the-back explosion. Regarding the damage during an arena combat: i wonder if the damage impacting the performace of your car during an arena fight would push the thing out of balance because people starts to be impaired in their movements toward the pickups. Again, in unreal tournament, you take damage but are in no way impaired because mobility is key to staying alive in that game. That is, of course, if the idea is to have cars needing to reach pickups for weapons. Afterall, isn't it easier to not have to deal with the physics of how a car, capable of going from 0 to supersonic in seconds, copes with having a blown up tire? TL;DR: maybe an option to hide the damage effects client-side (since they don't affect the handling) and i think arenas should retain people's capability to go fetch upgrades without impairment to preserve balance. Last edited by Unreal.2K7 on Thu Jul 09, 2015 5:00 pm, edited 1 time in total. Yeah, same. It's basically important that there is some logic in all that. It would be stupid to have cars destroyed by missiles and indestructible by hitting the buildings. Indestructibility of the cars is some kind of "strong points" of RollCage. They could've been only slowed down, but never destroyed. Otherwise the cars wouldn't give that feel of power like before. Some scratches could be tolerated though. I'd like developers to spend more time on buildings destructions instead of cars. Fully agree with Broscar here.